Founded in 1895, Richmond Dental and Medical is an award-winning, critically-acclaimed manufacturer of products and supplies for dental and medical clinics, including bite blocks, cotton balls, cotton pellets, braided cotton rolls, sponges, face masks, and dispensers. Our work together began with a website redesign. 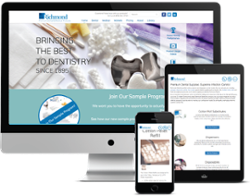 Once the design was launched, it made sense for Richmond to work with us further to grow their online presence. Over the course of the SEO campaign, traffic has increased by ~300%. Articles that were created for the campaign generated ~26% of total page views. Looking for results like these? Request a free consult. We'll spend 20 minutes together to discover if we can help.